By: Maryland Web Designers Corporation. John F. Kennedy once said that "Change is the law of life. And those who look only to the past or present are certain to miss the future." Even though we're pretty certain when giving this quote Kennedy wasn't referring to Search Engine Optimization and the importance of frequently changing the content of your website in order to affect your organic (or natural) ranking within the major search engines, we ARE sure that what he was saying was that change is not only good, but necessary in order to grow and be successful. Search Engine Optimization is the process of specifically using certain keywords and phrases within a site that will affect a sites ranking within major search engines. basically. The bottom line is if you want your business to be successful and have longevity on the web, then hire a website designer with strong search engine optimization skills. Perfecting optimization is not magic. No more magic than an accountant doing your taxes, a lawyer representing your case, or a doctor diagnosing your ailment. At Maryland Web Designers Corporation., we focus on innovative website design and hosting with a strong emphasis on search engine optimization and search engine marketing. We understand that it's not enough to have a beautifully designed site, well written content, easy-to-navigate menu, and so on. In Today's fast-paced and highly competitive market, your content doesn't just have to be relevant; it needs to be current and ever-changing. By current, we mean that your site needs to have the specific words and phrases that search engines are seeking. To complicate matters even more, your website has to be well written, spell checked, formatted correctly, and your key words and phrases should change or be added to quite frequently, while at the same time keeping up with changing trends that keep you ahead of your competition. Not to mention the new content on your website will give visitors a reason to come back to your pages, or possibly forward some information to a possible business prospect or a friend. Your new content can also be used as an extended marketing vehicle by submitting your new content or articles to the search engines or other websites, with of course links back to your site. Hence your traffic grows. Most users find websites by going to one of the major search engines (Google, Yahoo, MSN, Ask Jeeves, etc.) and typing in keywords or phrases related to their topic. Statistically, the first page will list 10 to 20 results along with sponsored PPC Listings where users are able to find their sites. Essentially, if your website doesn't rank high enough, your target audience won't make it to your site. Even if your website is listed on page two, you're out of luck - most internet surfers don't look past for the first couple of listings - essentially, your site is lost in cyber space. Perfecting optimization begins with the most important ingredient: Content. When writing copy for a website, it's important to have relevant, current content. The ultimate goal of a website is to be listed as one of the top 10 organic results on each of the major search engines. This placement essentially guarantees that your website will not only be found, but clicked on, giving you a better chance that the lead you worked so hard for will be turned into a sale, and therefore a return on your website investment. Each website needs to be optimized according to the target website viewer. For example, say your website is a Honda Dealership in Maryland; it is crucial that when you type in "Maryland Honda" YOUR automotive dealership comes up in that search on the major search engines. This is very important if you want to get Internet leads. Along the same lines, writing good, clear, and relevant page titles is also an important factor in search engine optimization. A good page title will increase your search engine placement results dramatically. For title page tags, being simple and relevant is key. For example, if your are a "Maryland CPA Firm" than Maryland CPA Firm should be in your title. If your selling t-shirts, then t-shirt should be in the page title. It's hard to believe that something so simple is so commonly overlooked, but surprisingly this technique is seldom utilized. In most cases, people are too descriptive and creative when writing page titles, not understanding that using too many keywords, punctuation and cutesy language can have an adverse effect on search engines browsers. Page title is only one of many factors that enter into matching up your website values with specific search engine algorithms. For example, if your values for a page title match your page title in a formula then you would have a higher ranking than someone who does not have a direct match. It's hard to believe some website designers, still name page titles; Welcome, Services and the infamous Home Page. Would you ever type in the aforementioned (Welcome, Services or Home Page to find your product or service on a major search engine like Google or Yahoo?) I should hope not! It is important to note that there are many companies on the Internet as well as many web designers that claim to be search engine optimizers or marketers, even going as far as guaranteeing a top ten listing. Our advice to you: be wary of these folks. The only way to guarantee a top ten listing is if you happen to own that particular search engine or portal. Optimization is an ongoing process, one that requires a consistent and regulated maintenance schedule. It is important to work within search engine guidelines in order to effectively optimize and promote the content of your website. Search engines seek out current, relevant content regularly using spiders and bots looking for specific keywords and phrases. It's important to have an experienced search engine optimizer continuously updating your website's content so that the search engines give your site a good ranking. Each search engine is unique in terms of the characteristics that factor into your specific ranking in their results. Sure, there are tons of other ways to market your website, but organic search engine results are by far the best way to go in terms of yielding results. That's why it's crucial that search engine optimization should be an important part of your marketing plan. In other words, why spend time and money building a website if you're not going to market it properly in order to achieve the best return on your investment. A solid marketing plan would allow for a minimum of $250 - $500 per month for optimization, not including content creation. Through successfully marketing our own websites, Maryland Web Designers Corporation. knows that Web-to-Web Marketing undoubtedly brings the most traffic to a website. 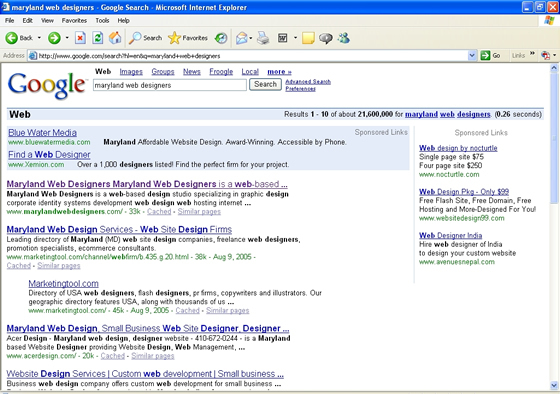 Maryland Web Designers Corporation. has proven formulas and techniques that will help your website get maximum exposure. We have 15 years of corporate start-up technology experience along with a wide range of search engine optimization practices with proven results that will propel your site to a higher search engine ranking. Using a highly concentrated website design architecture, key messages, phrases, content, images, links, and time tested proprietary techniques, Maryland Web Designers Corporation. will create an internet marketing plan that's customized to your specific business as well as your unique products and services. We provide monthly search engine optimizing maintenance and support so that your website stands ahead of your competition. We are proud to be #1. It's easy to put your faith in a company that is ranked #1 on Google.